Nestling in an elevated position amongst magnificent fir trees, the cabin, which has 3 bedrooms (1 x double, 1 x twin/double, 1 x bunk beds) provides holiday accommodation of the highest standard for up to 6 people within a peaceful and secluded 18 1/2 acre private woodland estate. 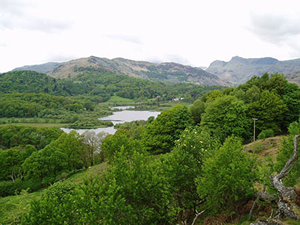 Boltons Tarn is particularly well positioned to give maximum privacy, is extremely well equipped & provides an ideal base for walkers, cyclists, or those who may just wish to relax and unwind. Well behaved Dogs (Max 2) are welcome visitors to our cabin. 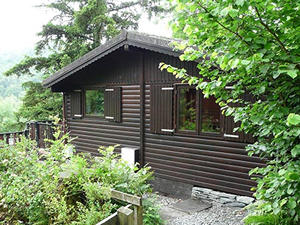 The cabin is easily accessible for most visitors however persons with severe walking difficulties should seek advice from the owners prior to booking. Due to it's location there is no wheelchair access. Access to cabin is down a short series of steps set out in groups of 8, 4, 4 & 2 (total number of steps 18 approx) with level sections between each group. Lounge which is tastefully furnished and extremely well equipped with comfortable leather sofas, freeview satelite 42" Flat Screen TV/DVD & DAB radio music centre. Fitted Kitchen fully refurbished in 2011, complete with electric cooker with ceramic hob, fridge, freezer, toaster, microwave etc. Shower room with W.C., hand basin & heated towel rail. Dining area with extending table to seat six. Outside there is a veranda leading onto a large secure gated sun deck equipped with table & chairs plus a BBQ area complete with brick built BBQ, picnic table & Sun Loungers provided for use by guests. Visitors to Boltons Tarn also have free use of the Estate Leisure Facilities (open 1st March to 15th November) including family sized swimming pool with built in jacuzzi, seating area, table tennis area, sauna cabin (local fees apply) and changing rooms. The building also has a public payphone, communal laundry, and a small shop. A "Badger Cam" has been installed to announce nocturnal Badger visits plus 2 Nest Boxes have had cameras installed to provide extra early season interest. The cabin is ideally situated to provide privacy and benefits from its views overlooking young woodland and fields down to Skelwith Bridge. The site is home to Deer, Squirrels and Badgers along with a large variety of Birds.